Bone lesions as a consequence of bone metastases in breast cancer patients can increase risk for skeletal-related events (SREs) (i.e., radiation to the bone, a pathological or osteoporotic fracture event, hypercalcemia, spinal cord compression, or surgery to the bone). The mortality risk for breast cancer patients with SREs subsequent to bone metastases is unclear. We assessed this relationship in a large, population-based cohort of breast cancer patients in Denmark. 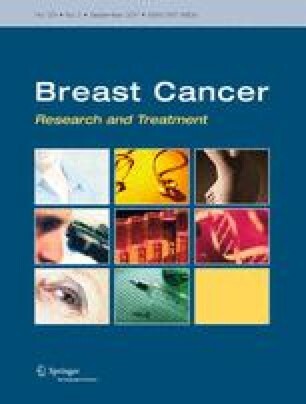 We identified 35,912 newly diagnosed breast cancer patients from January 1, 1999 to December 31, 2007 in the Danish National Patient Registry (DNPR) and followed them through April 1, 2008. Information on stage and treatment was obtained from the Danish Cancer Registry. We used the Kaplan–Meier method to estimate survival, and Cox’s regression analysis to estimate the mortality rate ratio (MRR) by the presence of bone metastases with and without SREs, adjusting for age and comorbidity. The 5-year survival was 75.8% for breast cancer patients without bone metastases, 8.3% for patients with bone metastases, and 2.5% for those with both bone metastases and SREs. The adjusted MRR was 10.5 [95% confidence interval (CI) 9.5–11.6] for breast cancer patients with bone metastases, and 14.4 (95% CI 13.1–15.8) for those with bone metastases and SREs, compared with breast cancer patients with no bone metastases but possibly other sites of metastases. A similar pattern persisted when analyses were stratified by stage or treatment. Breast cancer patients with bone metastases and SREs have a poor prognosis compared to those with and without bone metastases regardless of cancer treatment or stage of disease at diagnosis. This study was supported by a grant from Amgen Inc., USA and the Karen Elise Jensen Foundation. In conjunction with investigators at Aarhus University Hospital, Department of Clinical Epidemiology, investigators at Amgen Inc. were involved in the study design; in the collection, analysis, and interpretation of data; in the writing of the manuscript; and in the decision to submit the manuscript for publication.